Screen locks require anyone attempting to gain access to a family phone or tablet to input a predetermined set of information. Setting a screen lock not only prevents those without the password from using your teen’s phone but also from reading your teen’s personal texts and e-mails. Each OS provides users with a version of a screen-locking option, and each one is slightly different. 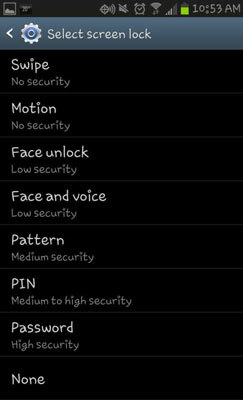 Under Security, tap Set Up Screen Lock. Android OS devices allow users to lock their screens using a variety of settings options. Windows phones allow anyone to use the Speech function to make a phone call without first unlocking the phone. However, the screen lock function does prevent unauthorized users from accessing private information, such as your child’s e-mails or contact list. Navigate to the Settings icon and tap Lock+Wallpaper. Choose to turn on Password and enter a password in the New password text box. Reenter the password in the Confirm password text box. Select Done to save your settings. To unlock your Windows Phone 7, flick your start screen upward to reveal a keypad where you can enter your password. Select Settings and tap General. On the General screen, select Passcode Lock. The Passcode Lock screen appears. Slide the Simple Passcode setting to On and then tap Turn Passcode On. On the Set Passcode screen that appears, enter a four-digit numeric code and then re-enter it to confirm. The Enter Passcode screen appears if you have Passcode Lock set up. If so, enter your simple password. 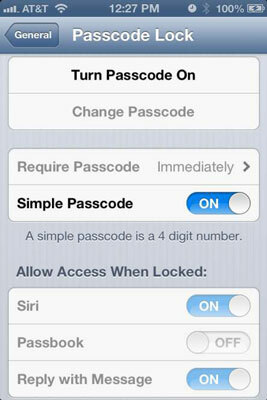 Slide the Simple Passcode setting from On to Off and enter your old simple password. On the Change Passcode screen that appears, enter your new passcode and tap Return. Re-enter your new passcode to confirm. Passcode Lock settings on iPads are very similar to the iPhone settings. After you locate the Passcode Lock screen under the General settings, simply select Turn Passcode On to change the passcode settings on your iPad.